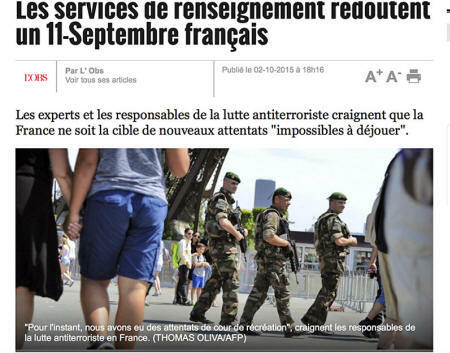 The Paris Terrorist Attacks - "9/11 French-Style", "Le 11 septembre à la française"
Terrorist attacks have been carried simultaneously in several locations in the Paris metropolitan area, according to early report. 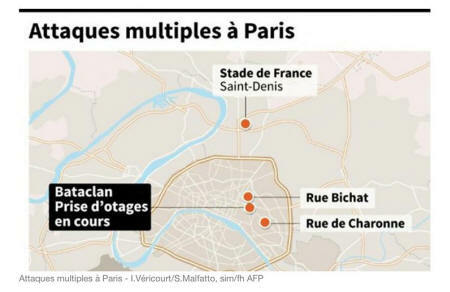 According to reports (at the time of writing) 100 people were killed in the Bataclan Concert Hall, when terrorists opened fire with automatic weapons. Another 15 were killed at the Stadium of France outside Paris. Official reports at the time of writing (21.00 ET) point to more than 140 deaths. Our thoughts are with the family members of the victims, who have lost their loved ones. Within minutes following the attacks, which were launched simultaneously, and prior to the release of a preliminary report by the police, France's media went into overdrive. News commentators and intelligence analysts on France's network TV stated with 'authority' that the attacks emanated from Syria and Iraq. The media coverage of these tragic events was casually linked up with the war in the Middle East, highlighting France's commitment - alongside its allies - in waging a "humanitarian war" against the terrorists. The attacks were described without evidence as an act of revenge and retribution against France for having bombed ISIS strongholds in Syria and Iraq as part of Obama's counter-terrorism air campaign. 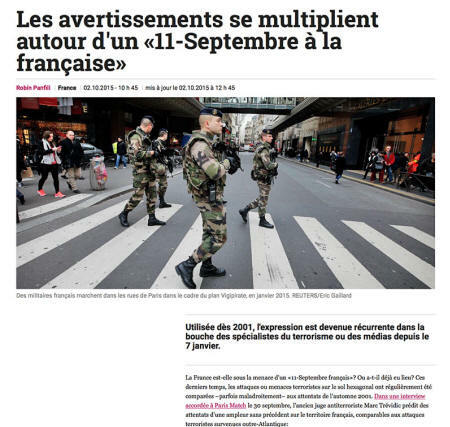 Paris Match on October 2nd predicted a French Style 9/11, "un 11 septembre à la française". None of the early news reports on November 13th, mentioned the fact that a large scale and well organized terrorist attack had been predicted. "Intelligence services fear a 9/11 French Style"
...suggesting that French intelligence is inept and unable to prevent a forthcoming catastrophe. 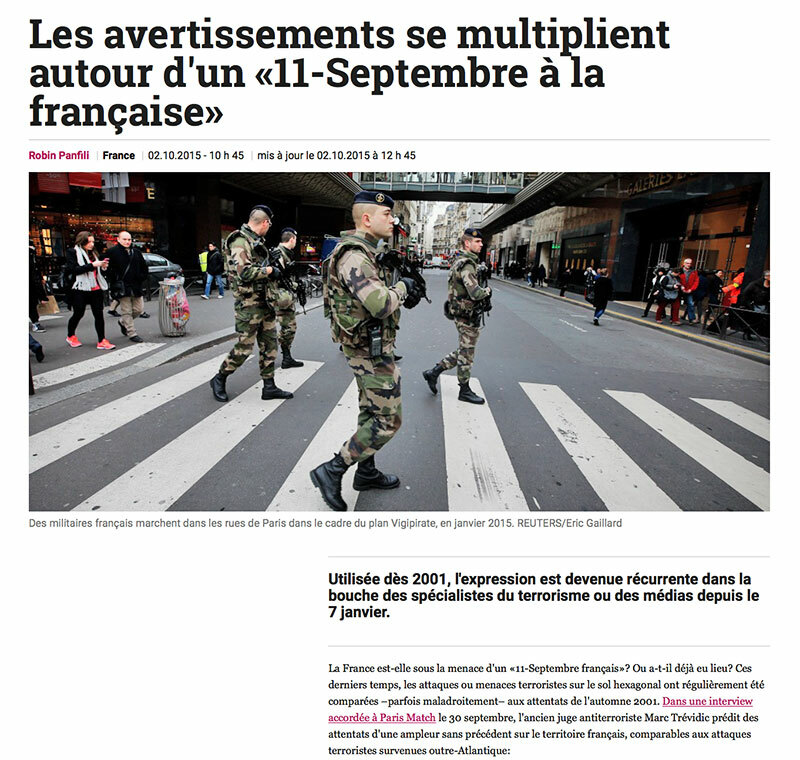 What was the role of this media hype by Paris Match? Create an atmosphere of fear and intimidation? 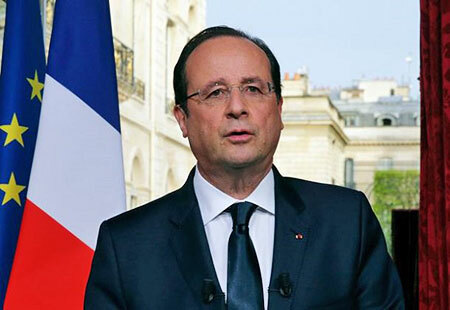 France's president Francois Hollande no doubt was aware of the October warnings. He had been briefed by his intelligence advisers. Shortly before midnight local time on November 13, president François Hollande announced drastic police state measures against an alleged terrorist network operating nationwide. It is highly unlikely, however, that Hollande took this decision spontaneously in the evening of November 13, on the spur of the moment in response to the attacks and prior to the holding of a cabinet meeting. The decision to enact a State of Emergency had no doubt been envisaged in advance of the attack in relation to a potential terrorist attack scenario. As we recall, the last time a State of Emergency was enacted was in May 1961 in response to the Algiers putsch (Putsch d'Alger), a failed coup d'état to overthrow President Charles de Gaulle's government. We have, on my decision, mobilized all forces possible to neutralize the terrorists and make all concerned areas safe. I have also asked for military reinforcements. They are currently in the Paris area, to ensure that no new attack can take place. Two decisions will be taken: a state of emergency will be declared, which means that some places will be closed, traffic may be banned , and there will also be searches which may be decided throughout Ile de France (greater Paris). The state of emergency will be proclaimed throughout the territory (of France). The political discourse is in some regards reminiscent of the 9/11 attacks and the statements of George W. Bush et al. President Hollande had ordered by decree without debate or consultation with France's National Assembly the enactment of a State of Emergency throughout France, coupled with the closing of France's borders allegedly to prevent terrorists from coming in, and from terror suspects from leaving the country. The measures also included procedures which enable the police to conduct arbitrary arrests and house searches without a warrant within the Paris metropolitan area opening up the development of a potential hate campaign directed against France's Muslim population. These drastic police state measures (including the repeal of habeas corpus) ordered by president Hollande were decided upon prior and in the absence of a police report. Initial reports confirmed the involvement of half a dozen terrorists. There was no evidence of a nationwide terror network. But as we mentioned above, Hollande had no doubt been briefed by French intelligence which had, according to reports, "predicted" the possibility of a 9/11 style attack. (October 2 media reports). "a terrorist army with unlimited potential…"
"The threat and diverse forms it can take suggest that our counter-terrorist abilities are no longer effective as they used to be"
President Hollande assumed that jihadists were behind the attacks, but when he made his speech, there was no evidence from police sources to support his statements. 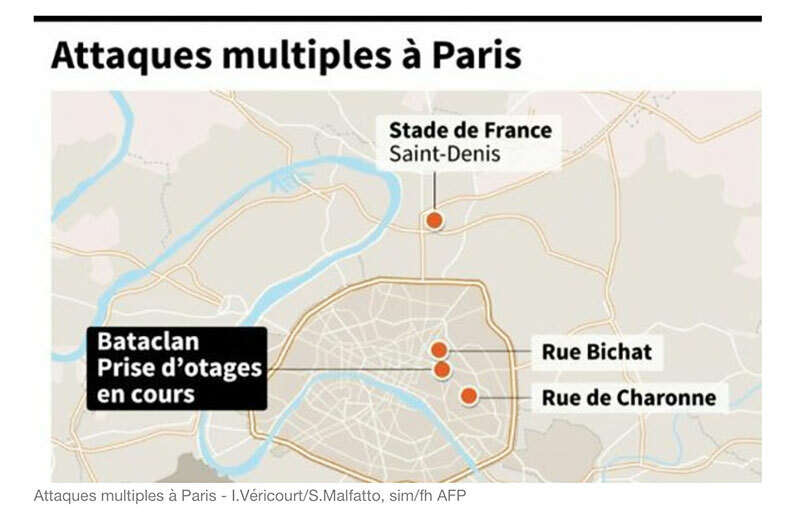 Moreover, with regard to the Bataclan Concert Hall where there were more than one thousand people at a Rock concert, the reports confirmed that there were four kamikaze terrorists, all of them were killed. As in the case of Charlie Hebdo and the Kosher Grocery Store terrorist attacks in January 2015, the terrorists were killed rather than arrested and indicted. Was there an attempt on the part of the police to capture them alive? Moreover, the media was held at bay, they were not allowed to report what was happening within the Concert Hall, they were prevented from talking to the witnesses underlying this tragic event. Meanwhile a curfew was imposed. I just want to make a few brief comments about the attacks across Paris tonight. Once again, we've seen an outrageous attempt to terrorize innocent civilians. This is an attack not just on Paris, it's an attack not just on the people of France, but this is an attack on all of humanity and the universal values that we share. We stand prepared and ready to provide whatever assistance that the government and the people of France need to respond. France is our oldest ally. The French people have stood shoulder to shoulder with the United States time and again. And we want to be very clear that we stand together with them in the fight against terrorism and extremism. We're going to do whatever it takes to work with the French people and with nations around the world to bring these terrorists to justice, and to go after any terrorist networks that go after our people. We don't yet know all the details of what has happened. We have been in contact with French officials to communicate our deepest condolences to the families of those who have been killed, to offer our prayers and thoughts to those who have been wounded. We have offered our full support to them. The situation is still unfolding. This is a heartbreaking situation. And obviously those of us here in the United States know what it's like. We've gone through these kinds of episodes ourselves. And whenever these kinds of attacks happened, we've always been able to count on the French people to stand with us. They have been an extraordinary counterterrorism partner, and we intend to be there with them in that same fashion. Obama is committed to helping the French people, in going after the terrorists. France is a partner of Obama's bombing campaign initiated in August-September 2014 which theoretically is directed against the ISIS. "We know where [Syria, Iraq] it comes from, who these criminals are, who these terrorists are". "this is an attack on all of humanity and the universal values that we share." Who is Behind the Terrorists? What the French media in its coverage of these tragic events fails to mention is that both the US and France, not to mention Britain, Turkey, Saudi Arabia, Qatar and Israel are covertly supporting various Al Qaeda affiliated terrorist formations in Syria and Iraq including al Nusrah and the Islamic State. France is the victim of the Islamic State, but at the same time the US and its allies including France are "State sponsors" of the Islamic state which is an Al Qaeda affiliated entity. Lest we forget, the US has supported Al Qaeda and its affiliated organizations for almost half a century since the heyday of the Soviet Afghan war. CIA training camps were set up in Pakistan. In the ten year period from 1982 to 1992, some 35,000 jihadists from 43 Islamic countries were recruited by the CIA to fight in the Afghan jihad. Since the Reagan Administration, Washington has supported the Islamic terror network. 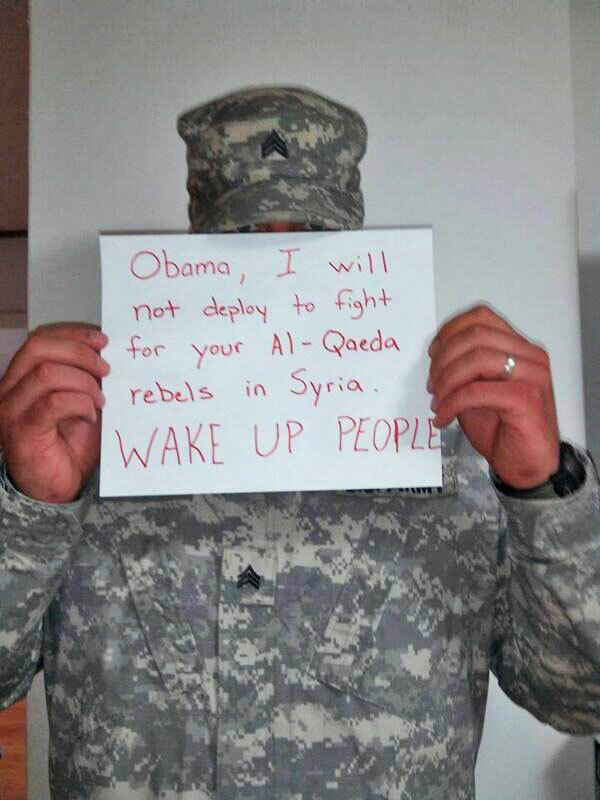 In recent developments in the Middle East, the terrorists are recruited and trained by the Western military alliance. NATO and the Turkish High Command have been responsible for the recruitment of ISIS and Al Nusrah mercenaries from the outset of the Syrian insurgency in March 2011. "a campaign to enlist thousands of Muslim volunteers in Middle East countries and the Muslim world to fight alongside the Syrian rebels. The Turkish army would house these volunteers, train them and secure their passage into Syria." 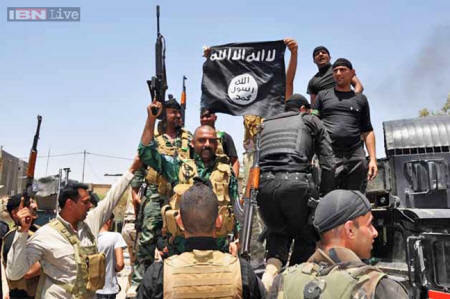 There are Western Special Forces and Western intelligence operatives within the ranks of the ISIS. British Special Forces, and MI6 have been involved in training jihadist rebels in Syria. The ISIS brigades were involved in the US-NATO supported insurgency in Syria directed against the government of Bashar al Assad. Since August-September 2014, they are the object of Osama's fake counter-terrorism campaign. The evidence, however, amply confirms that ISIS is protected by the Western military alliance. With regard to France, a Washington Post 2011 report entitled "France sent arms to Libyan rebels," confirms the role of the French government in support of the Al Qaeda affiliated Libya Islamic fighting Group (LIFG). While Hollande's predecessor, former French President Nicolas Sarkozy would be the one to set foot in decimated Libya in the wake of NATO's intervention there - which included in addition to French arms sent to terrorists, French planes providing these terrorists air cover as they carried out atrocities and genocide - Hollande would continue policies enacted under Sarkozy, both in Libya, and currently in Syria. The UK Foreign secretary William Hague, and his French counterpart Lauren Fabius, are leading an isolated charge within the EU to lift a supposed arms embargo to self-described 'rebels', hitherto destroying Syria for over two years. Several underlying factors need to be addressed before these diplomatic (some would say military) maneuvers are put into context. Firstly, the most obvious issue with allowing the UK and France to freely arm 'rebels' of their choosing inside Syria is that this policy is against all international law, and will, as proven already to be the case, continue to vastly exacerbate the growing death toll and displacement in Syria. "Transferring more weapons to Syria can only exacerbate a hellish scenario for civilians. If the UK and France are to live up to their own commitments - including those set out in the new arms trade treaty - they simply must not send weapons to Syria." In recent developments, the ISIS and Al Nusrah have joined hands. The evidence amply confirms that while Russia is targeting ISIS strongholds in Syria, the Western military alliance is supporting the Islamic State terrorists. The notion that the Paris attacks was an act of retribution and revenge directed against France is questionable and contradictory inasmuch as the evidence confirms that France has been channeling weapons to jihadist rebels in Syria including Al Nusrah and ISIS. On November 13, France was the victim of a carefully organized terrorist attack in different locations in the Paris metropolitan area, resulting in more than 140 deaths. The Islamic State was identified as the architect of this criminal undertaking. What is intimated in the media reports of these tragic events is that the jihadists are attacking France. But at same time, the countries which claim to be the victims of terrorism including France are involved through their intelligence services in supporting terrorist organizations in the Middle East. It's called America's "Global War on Terrorism". This contradiction has to be meaningfully addressed at the political level. The Global War on Terrorism is a lie which provides legitimacy to police state measures. A telephone hotline is opened. Citizens are invited to call and report anything which they consider suspicious. Civil rights have been suspended. Arbitrary arrests are occurring in Paris without warrant.